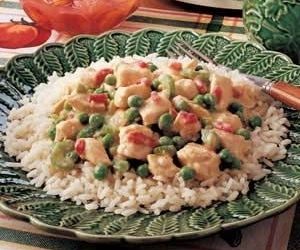 Chicken a la King is a slow cooker recipe served over rice. Combine soup, flour and peppers in crock pot, stir until smooth. Stir in chicken, celery, onion and green pepper. Cover and cook on low 7-8 hours or until meat is cooked through. 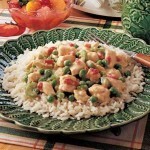 Stir in peas and pimentos. Cook 30 minutes longer.